On Sept 26, the United States sanctioned the Dandong Hongxiang Industrial Development Company for laundering money for North Korea and aiding North Korea’s nuclear weapons program. The United States also froze the company’s assets, indicted four of its high-level employees, and moved to seize 25 of its bank accounts. This marked the first time that the Obama Administration has sanctioned a Chinese firm for its ties with North Korea. The company’s chairwoman, Ms. Ma Xiaohong, was arrested by Chinese officials and is currently under investigation by the Chinese government. Prior to the crackdown, the Obama administration had been pressured by lawmakers on the Hill to tighten sanctions and ‘secondary boycott’ of Chinese entities abetting North Korea’s nuclear program. Sen. Cory Gardner (R-CO), in particular cited a report jointly produced by the Asan Institute for Policy Studies and C4ADS for providing the necessary information related to Hongxiang Industrial’s illicit trade with North Korea. During the ‘Subcommittee on East Asia, the Pacific, and International Cybersecurity Policy’ hearing on Sept. 28, Sen. Gardner questioned whether the latest action by the administration would have happened without the work of the Asan Institute and C4ADS.1 The report has also gained traction in South Korea with widespread media coverage. Critics have called on the government to utilize the similar investigative method to uncover more illicit activities between China and North Korea.2 It remains to be seen, however, whether the South Korean government can do anything to address this problem in the existing sanctions regime even if it is able to identify other entities engaged in illicit trade with North Korea. The first presidential debate between Hillary Clinton and Donald Trump recorded high ratings around the world. South Korea was no exception when Yonhap News TV recorded a rating of 1.41 which is comparable to one of the top 11 Korean dramas according to Nielson Korea. The interest in this year’s election is driven by its implications for South Korea. According to a recent public opinion survey, 91% of Koreans agree that election result will have an impact on South Korea’s economy, trade, and security (2% said it will not). In terms of preference, South Koreans appear unified in their support for Democratic candidate Hillary Clinton. 82% of South Koreans stated that they would vote for Hillary Clinton while only 3% sided with Donald Trump. When asked to assess Clinton’s prospect as president, 22% answered that she will become a better president than Obama (11% said she will not). On the contrary, only 4% of respondents stated that Trump will be better than Obama. 70% of South Koreans disagreed. Preemptive Strike on North Korea? According to Gallup Korea, 71% of respondents saw the new law as a positive, 15% saw it as a negative development.18 The number of proponents has increased compared to the last two surveys in March 2015, when the act passed the Assembly and during May 2016, when the legislation was announced. Proponents expect the new law will eliminate corruption (31%), make the society more transparent, reduce graft (14%), change attitudes of civil servants and environment (9%), as well as reduce bribery (9%). Opponents, however, are concerned about the impact on the overall economy (21%), excessive regulations (15%), efficacy (14%), and stringent standards (12%). The Park administration will spend KRW 10 trillion during the fourth quarter to stimulate the economy and achieve the intended target on growth (2.8%).21 The ministerial level meeting on the economy pointed to several downward pressure to the economy during the fourth quarter, including the enactment of the new anti-corruption law, delayed discount on tax related to replacements of old diesel-fueled cars, labor strikes, and court receivership of Hanjin Shipping, among others. Hamish Macdonald, “China accused of inaction on N. Korea sanctions in Senate hearing,” NKNews, Sept. 28, 2016. “무기용 희토류 팔고, 北천연자원 사들여… 해킹부대 지원도,” 동아일보, 2016년 9월 20일; “오바마, 임기 말에 북한 제재 놓고 중국과 얼굴 붉힐까,” 경향신문, 2016년 9월 20일; “北기업, 유령회사 세워 교묘히 무역 제재 피해가,” 중앙일보, 2016년 9월 19일; “빈라덴 잡은 기법 활용해 北-훙샹 核커넥션 밝혀내,” 동아일보, 2016년 9월 29일; “美가 증거 내밀자 수사 나선 中 이중 플레이,” 조선일보, 2016년 9월 21일; “中정부에 교역 단속 강제할 방법 없어 정부 ‘관련정보 파악… 대처방안 모색’,” 동아일보, 2016년 9월 20일. Gallup Korea, Date: August 16-18; sample size: 1,007; margin of error: +3.1 at the 95% confidence level. “선제공격의 국제법적 근거와 한계,” 동아일보, 2016년 10월 6일. “북한 핵공격에 무방비, 원자력잠수함이 대안,” 중앙일보, 2016년 10월 6일; “핵추진 잠수함을 빨리 만들자,” 중앙일보, 2016년 9월 29일. “북 도발원점 선제타격 킬체인 KAMD 구축, 2년 빨라진다,” 중앙일보, 2016년 10월 6일. “엘리엇, 삼성 지배구조 개편 돕고 경영간섭 의도…’경제민주화법 통과되면 투기자본 놀이터된다,” 조선비즈, 2016년 10월 7일. “野 대주주 견제법안 낸 6월에… 엘리엇, 삼성전자 지분 본격 매입,” 동아일보, 2016년 10월 8일. “삼성그룹 지배구조 개편이 넘어야 할 국회 발의 법안 4가지,” 경향신문, 2016년 10월 8일; “헤지펀드 끝없이 공격하는데…야당은 ‘대주주 경영권 제한’,” 한국경제, 2016년 10월 6일. “담장 위 걷는 기업지배구조 개편,” 동아일보, 2016년 10월 8일. “엘리엇의 삼성 지배구조 시나리오, 현실화 가능성 작다,” 연합뉴스, 2016년 10월 10일; “삼성 지배구조 개편, 금융계열사로 번지나,” 동아일보, 2016년 10월 8일. “김영란법 오늘부터 시행, 청와대 ‘누구나 공정하게 경쟁하는 청렴사회 만드는 획기적 전환점 되길 기대,” 조선일보, 2016년 9월 28일. “데일리 오피니언 제 230호 (2016년 10월 1주) – 김영란법 시행, 시법시험 폐지,”한국갤럽, 2016년 10월 6일. Gallup Korea, Date: Oct. 4-6; sample size: 1,009; margin of error: +3.1 at the 95% confidence level. “최근 경제동향과 대응방향,” 관계부처 합동, 2016년 10월 6일. 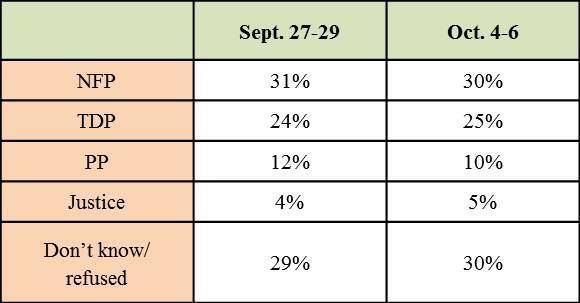 Gallup Korea, Date: Sept. 27-29; sample size: 1,004; margin of error: +3.1 at the 95% confidence level.